Moving Beyond Stress and Chronic Pain ...and Getting Your Life Back! When you think of top flight accomplishment and inspiring performances, who comes to mind? Paula Abdul dominating the charts and stunning audiences with her concerts? Debbie Allen's innovative dance and choreography? Or perhaps Joe Theismann's and Brett Favre's gritty competitive games? George Clooney's, Kathleen Turner's or Melanie Griffith's movie performances that transport you to another place and time? They are all at the top of their respective games...while dealing with chronic pain. They have each made the commitment to themselves to use their chronic health challenges as a chance to practice being stronger than their pain, to transcend it and keep on going, achieving full professional and personal lives and careers. You'd never know these folks have chronic, sometimes debilitating pain. Living with chronic pain is very stressful as well. So, if you are living with pain, the accompanying stress levels compound the problem. You, too, can tap into your inner strength to take you beyond your pain and stress so that you can accomplish your dreams. Find out how by registering for this free presentation given by my friend Liz Parrish. 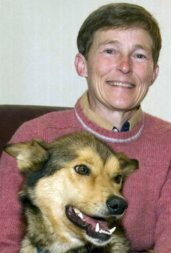 She has also dealt successfully with chronic pain by utilizing special teachings from her sled dogs, and she wants to share with you how to move beyond your health challenges for personal and professional success. Register Here to Learn What Liz’s Sled Dogs Taught Her! One Final Point!! Enjoy Your Halloween Experience! Plan ahead and keep your children safe by monitoring their activities and checking the treats they bring home!